Anyone Built/Running a 3rd Gen Ford Expedition? "expedition' is a tough term to search on around here..
Google is only slightly more helpful..
Is it just because of the IRS? I get that the IFS/IRS limits extreme off road action, but Expedition Travel isn't usually about rock crawling, and Gears and lockers are available for it.. Even if Suspension/Lift products are hard to come by.. Seems like it could be a good full size platform, EL/Max versions included.. I really like the way these things look, nice big greenhouse. I've never driven or sat in one though. The AdvanceTrac is supposedly pretty great, gives you "fake" F/R ELSDs, and they have a decent amount of travel stock. Front suspension is the same as the F150, so pick and choose any kit from mild to wild for that. The 5.4 gives me the heebie jeebies a bit, but I'm sure some Ford fans will come say different about it; I'm just more of a Chevy guy and the LS is rock solid. EcoBoost on the later models if thats your cup of tea. Used prices fo WAY up for those, tho. Nice big fender wells, fit 33s real easy, 35s easy too. Yeah, don’t see why not. “Overlanding” comes in all shapes and forms. Most people do think about needing to have a very capable offroad platform, but really you don’t. Here is a thread of photos of lifted 3rd Gen Expeditions, some on 33's, some on 34's, a few on 35's. But still nothing really about trucks outfitted to, and going offroad. Anyone know of any builds around other than Adventure Driven's? I had a stock Expy 3rd gen for many years. Loved the ride, very comfy. Only got about 14 mpg or so on the highway, not towing. The 5.4 ran good, but I had the heads with only 3 rings of thread in the plug holes and blew several plugs out. Thankfully I got the warranty when I bought it, so the $500 repair only cost me $50. Heli coil the threads, new coil pack ( the plug goes through it when it blows) and labor. I would not recommend the 5.4 engine. 3rd gen Expedition plugs weren’t a problem. 1st gens were. 2nd gen plugs break off in the head. 3rd gen they finally figured it out. I would guess it's just that as decent as the 3rd gen Expedition is, it doesn't have any feature that distinguishes it over the much more common and much easier to modify Chevy/GM platforms. The problematic 5.4 on the early models probably keeps some folks away and I'm sure IRS does too. I don't know what the raw sales numbers are for the Expedition vs. the Suburban/Tahoe/Yukon/Yukon XL/Escalades are but from my seat-of-the-pants observation, the numbers seem to be about 5:1 in favor of the GM products. So it's not just that "overlanders" shun the Expedition, Ford itself seems to have, at best, a half-hearted interest in them. Given that Ford seems to make a dizzying array of SUVs it's not surprising that the big Expedition gets lost in the shuffle. 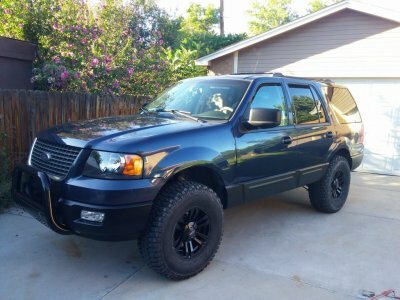 Really, for the question "why don't we see more Expedition builds" you could substitute "2008+ Sequoia" or "Nissan Armada" just as well - all are decent full sized platforms that market to the Soccer mom base, but are virtually unheard of on these pages. I think there are a lot of benefits to the Expedition platform. I do think Ford could market them to the same customers as the ones currently buying Suburbans and Yukon XLs, but for whatever reason, Ford is content to leave that market to GM. IMO Ford's BIG MISTAKE WRT the Expedition was dropping the V8 option in 2015. If they had offered the Expedition with the F-150's 5.0 V8, it would have been more attractive to a lot of people (including me.) Personally, I have ZERO interest in anything turbocharged. A NA V8 would get my interest though. According to the rumor mill, the Suburban and Tahoe are losing their solid rear axles with the next iteration so at that point, the Expedition may be more of a contender in the full sized SUV field. In truth, I don't think even GM regards these full sized "SUV's" as true "utility" vehicles anymore. They're luxury station wagons with 4 wheel drive. If you want true "utility" and the ability to carry a family your only real choice is a crew cab pickup. As I've said before, in both the mid-sized and increasingly in the full sized US market, the crew-cab pickup has all but replaced the body-on-frame SUV as the vehicle of choice for people who need true utility or off-road capability. I do think Ford could market them to the same customers as the ones currently buying Suburbans and Yukon XLs, but for whatever reason, Ford is content to leave that market to GM. I'm not sure I understand what you mean by that statement. They do make an Expedition EL / Max to compete against the Suburban / Yukon XL. No Doubt GM has cornered the market so to speak, sales of the Tahoe and Suburban are exponentially higher than the Expedition and Expedition EL/Max without a doubt. I'm surprised Ford no longer offered the V8 in the Expeditions as either a base or optional engine. I know some don't like turbos, and I haven't driven either of these beasts off road, but I can tell you, to me at least, on road the 3.5 EcoBoost has a much stronger feel, much more low end torque, and it almost feels like a diesel in that it hardly ever has to downshift, it just rides that wave of torque. I've driven the current platform GM and a 2017 Ford, and personally prefer the Ford from a Mechanical and ride/drive standpoint. The 2017 Suburban I drove felt sluggish and under powered by comparison. That being said, GM has a better interior by far however (well, Ford kills them on the third row and cargo area, but GM materials, design and fit and finish in the front seat is much better than the 3rd Gen Expeditions), and I suspect more people care about that. I also like the 'old school' look and outward visibility of the 'up to 2017' Expeditions far better than the 2018 and on, and the current GM platforms, with their high belt-lines, and short greenhouse..
What I mean is that you hardly see any of them around. Yes, they make them, not sure who is buying them but I'll go back to my earlier statement that the ratio of GM to Ford in the full size SUV arena is at least 5:1. In fact, that may be generous to Ford - it could be close to 8:1. You can't watch 5 minutes of TV without hearing comedian Denis Leary's tough-guy voice spouting off about the F-150 but you never hear a peep about the Expedition other than generic "Ford's SUV lineup" advertising in which the Expedition plays an "also available" role. Does Ford even market the Expedition anymore? I've never seen an ad for an Expedition on TV (except as noted above) nor in any print magazine except maybe in a car magazine (and then it was only when the "new body style" came out for 2018) nor online anywhere. In fact, I didn't even know about the Expedition EL until I saw one driving down the street. If Ford wants to take on GM in the full-sized SUV field, shouldn't they at least, you know, advertise a little? The EL ought to be aimed at the same customers who keep buying the Suburban and Yukon XL year after year but Ford doesn't seem to make even the slightest effort to let people know they exist. But who knows - maybe this is some kind of backwards "hipster" marketing technique? "What am I driving? Oh, it's this really obscure SUV called the Expedition EL. You've probably never heard of it." But AFAIK all 4wd versions of the Expedition retain the 4h - 4L transfer case.